I set the alarm for 4 am. Originally uploaded by G L U Z. Once again I'm learning something new. I like this, whatever it is. Looks like a floor to me. So this is what "Blog This" means. 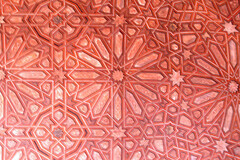 That looks like Islamic design, but I thought maybe it was a ceiling.